In today’s competitive world and busy running life at workplaces, when the employees tend to work even when they are not well, it is known as presenteeism. It can also be defined as if the employees work more hours than the required number of working hours at workplace. Many still are there who prefer to take leave when sick. Whether you are actually sick or truly under the weather just need a mental health day, here are some of the rules for calling in sick to work which you need to follow. Why you Should Call in Sick ? When you come to work even if you are sick, it is known as presenteeism. This may sound heroic but actually is harmful to the organization. Being sick and working among other employees would surely make others uncomfortable as there are chances of spreading of germs. “You always have to weigh the risks and the benefits,” says Dr. Aaron E. Glatt, M.D., a spokesperson for the Infectious Diseases Society of America and president and CEO of the New Island Hospital in Bethpage, New York. It is always Ok to call in sick to your employer if you really sick. This will be a blessing in disguise for your employer and other co workers of the organization as they can avoid a unproductive and germ sperading atmosphere at workplace. Talk to your manager over phone. No fake coughing or sneezing over phone. Becoming sick is not something we do intentionally, moreover it is not in or control. In such cases, call in sick at work is very important. As every thing should be done in a particular process, it is very important to follow a proper procedure to call out sick to work. There are many employees who do take off when they are sick fearing they could lose their jobs. Well, as per my view, this is not at all right. You first need to take care of your health, as health is wealth. Moreover not taking leave when you are sick can worsen your health and can effect your personal and professional life. Taking up leaves for being sick can be sanctioned by the employers if you can make them understand about seriousness of your condition. The sick leave policy changes from company to company. Also the employment is considered “at will”. This is a policy where you leave the organization with out any explanation and also your employer can fire you without any explanation. You being sick can also be one reason for your employer to fire you, unless you are a member of union and have signed contract with them. There are some mistakes that you should avoid while calling out being sick at work. 1. Call your employer as soon as you can. 2. Never try to fake. 3. Organize everything to get the work done. Think of the co-workers in the office who might also get sick if you are contagious. What if the whole office gets sick? How the office work runs and the output will at the same time be quite unproductive? If you know you are not well then it is better to stay at home. Coughing, sneezing or having a running nose should not let the work of others get disturbed. Not just this, if you feel like giving some extra work to someone in the office, do not shy away from that. Just give and relax for a day until you get well. The bosses are fine with you doing nothing whole day but sitting in the office than staying at home entire day out of sickness. It helps in serving you the best when you are productive during your presence and unproductive when absent. If you think you will be able to give your 100% in the office then reach the workplace otherwise no need to go, hence calling in sick to work. Nowadays, many options are there for work. It is not at all necessary to work from office, with the help of technological advancements, the work can be done from anywhere with the help of the computer and internet connection. So, work from home option should be utilised by you when not well to travel to the workplace. But in case you actually are not well even to work from home, then just sit aloof from the work and take proper rest. If you have started to feel lazy and feverish, then it is better to inform beforehand. You might also prepare a list of the task to do in your absence. Give that list to one of your group colleague or the subordinate. Place it on your desk properly and work as per it. So, above are some of the reasons for calling in sick to work. Call in Sick Days at Work, What to Say? It’s a human nature that everyone needs an occasional day off for mental health break. Unfortunately, many workplaces do not offer holidays quite often with much spontaneity. So, one has to take an off calling it a sick day. In order to do so, you will have to convince your colleagues before you make a final call to your boss. 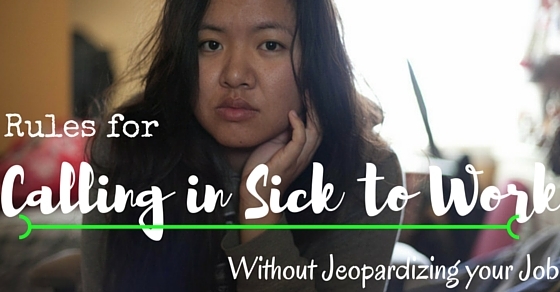 Here are some of the tips to know how to and what to say when calling in sick to work. You might think that everyday is a good day to fake your sickness, but it is actually not so. You need to have a proper thought process in order to make a final call to your boss. The day should be perfect because if you pick a wrong day it would, however, affect your day. Make sure all the odds are in your favor before you execute a master plan. You need to have convincing power so that the colleagues know that you are actually ill even when you are not. If you are not able to convince your subordinates then it will be a bit harder to let your boss know that you are true and need a very long holiday for being sick. Also at the same time make sure you haven’t been sick any before for the similar long period of time. Not just this, also do not fall sick after you have any trifle or grumbling at work. This will put an impression that you are running away from your duties at work. You need to lay down some groundwork before you execute a master plan. If you are preparing for getting ill the next day then cough a little to show that you are getting sick, even sniffle a little, lead your coworkers to ask you whether you are fine or not. So, this way you need to build a foundation for the future plan of having a leave. Knowing your illness throughout is the way by which you can win over anyone. Even though your boss will not ask too many queries, still you should know what is your illness all about and know it inside out. Instead of saying that you do not feel well, just say that you have a migraine, flu or whatever you have. Stating the illness will give solidarity that you actually are ill and are suffering from some problem. If you want to take multiple days off then pick up a good illness excuse or reasons to call in sick. You will have to tell the boss about some serious problem which could last for more days like you can inform your boss about a migraine, viral fever or something like this. Only then you will be able to win over their confidence, that yes you are not well and cannot work for two days continuously. Not just this, you can also tell them about what doctor might say for taking rest and so on. If you need to have a leave for two consecutive days then you must know about the illness thoroughly. Know what are its symptoms and what can be the consequences more adverse than what is it for now. Having known your illness can give the boss immense confidence that whatever you are saying is right and also you can get leave without any question answering process. If you have informed your colleague about the same then he or she can help you form a foundation for the excuse you tend to make. Also, you can ask your colleague to give some back by informing the boss that you are not well and will not visit the office for 2-3 days. So, by this also you can ask for a leave by calling in sick. So, above are some of the ways by which you can go on leave for more than one day and can rest, relax being away from the regular humdrum of the life. When you are sick the best way is to stay at home than going to the office to work. This is because, during sickness, the infection spreads and if the boss hears more complaints then anyway you have to go home. So, it is an etiquette to let the boss know your problem before he or she gets it across through other infected people. Not just this, but also your performance level would go deep down if you are not able to perform well due to the sickness. Then also it has the possibility of putting a bad impression on the boss as well as the other colleagues. So, this is a good habit to inform the boss that you are not feeling well and could not be able to perform well due to the illness, which would only affect the work output; indeed not acceptable to anyone in the workplace. There will be no better reason to stay at home than a legitimate sickness, when if it is contagious like cold and flu. A sick employee is certainly not a productive employee as he or she can spread germs all around making others sick as well. Just do everyone a favour at work, stay at home for few days until you get better fully. If you have been feeling blah or just frustrated, then there is a need of taking a break from the regular tension of the life. You need a day off to recharge yourself. Just schedule a mental health day in advance so that you don’t have to make co-workers worry for the extra task to do. So, these can be some of the reasons to let the boss know that you call in sick for the good and authentic believable reasons. No doubt your workplace is super lax about the absences still you will have to write down to the boss for the sick email or telling about the illness which is at times quite nauseating. While you are informing about your sickness, make sure you are writing in brief. Calling out sick email should not be long, do not elaborate anything. Just be brief and crisp in your writing. No one wishes to hear the glory details of the illness whether it is a stomachache or something else. So, do not give the glory details to the boss in your email. Just let him know the reason for sick leave for which you not being able to attend the office. Only this is one thing you are supposed to go through the email. Be grateful at the end for asking a leave and also give your phone number so that the colleague can contact you whenever required for the work purpose, during the doubts. Also, mention in the email that whether you will be working from home or no even if you are not visiting the office same day. This will put up a great impression and also if you will be working from home, it would not leave the colleagues in worry about the pending work to be done. So, clear everything in your email. Above are some of the ways by which you can understand what to do if calling in sick to work. This has to be done quite often in order to get away from the rat race for a while. This is because not every company liberates its employees with holidays and leaves. So, this has to be done in a smart manner.